According to the WWE Network’s 100 Best Matches…List, this is the best women’s wrestling match on the WWE Network. There are only two women’s matches on the list, by the way. In an ideal world, there’d be far more women’s matches on the list. But wrestling has been dominated by men for a long time, and it’s only in the past couple of years (in the Western wrestling world) that women have risen in wrestling stature. Sure, you can point to Trish Stratus, Lita, etc, but they existed in an era where a women’s assets meant her breasts. Now, women regularly main event Raw and Smackdown (if not PPVs). And, in my humble opinion, Sasha Banks vs Bayley is the peak of modern women’s wrestling. Yes, they may have moved onto the big leagues, but nothing gets better than this match. It’s not just about the match, either, but the build-up. WWE have almost ruined Bayley and Sasha Banks on Raw. Bayley won the title from Charlotte earlier on this year without much fanfare in questionable fashion. It would have been easy to copy Bayley’s NXT route to championship gold in her Raw run. In NXT, Bayley was an underdog comparable to Sami Zayn (see my review of #100 Adrian Neville vs Sami Zayn for more information!). She continually lost, but her heart and dedication won over the fans. Slowly but surely, she clawed her way to face the NXT Women’s Champion, Sasha Banks. Her contemporary female wrestlers, Charlotte, Becky Lynch and Banks herself had been called up to the main roster. It was up to Bayley to carry the torch…but could she beat Banks at NXT Takeover: Brooklyn? Neither woman has been able to have a match of this calibre again, and they never will (probably). They have great chemistry in the ring but they fought at the right time in the right place. The crowd was extraordinarily hot for their encounter. Everything clicked with barely a botch in sight. They told the perfect story, the underdog against the cocky, dominant heel. It’s a tale as old as time, but the same old tale looks revolutionary when told by revolutionaries. Banks tried to slow things down in the early goings, but Bayley exploded back with her typical flourishes of offence. The malevolent Banks viciously curtailed Bayley’s motions by targeting Bayley’s injured hand. I think this is where the match turns into something special. Without exaggeration, this is on the level of Austin vs Hart or HBK vs The Undertaker. 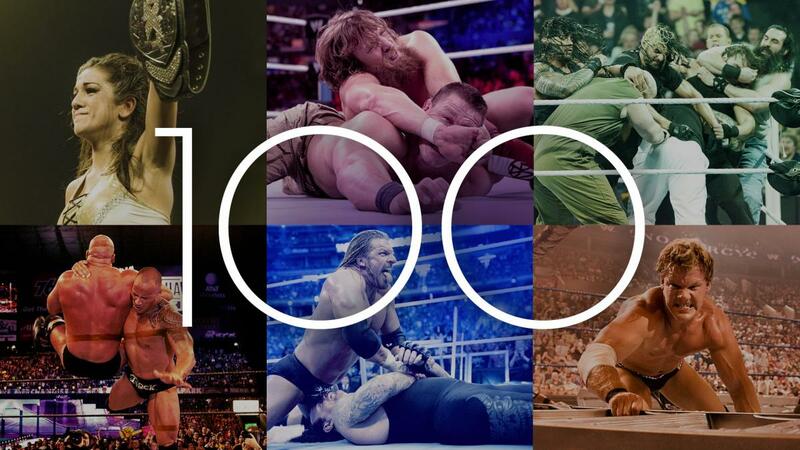 It should be at least in the Top 20 in the WWE Network’s 100 Best Matches…List. If you don’t have tears in your eyes at the end, then you have no emotions! This is the epitome of women’s wrestling. Yes, the NXT women may have wrestled at WrestleMania, fought in main events of PPVs and had Match of the Year contenders since they debuted, but they will not top this match. It’s a case of something happening just at the right time, with a great story and build behind it, told by two wrestlers who got everything right on the night. Check out their rematch, at NXT Takeover: Respect. That main evented the event, but couldn’t come close to toppling this encounter. VERDICT: 10/10. This is the best women’s match in WWE history, without a doubt. However, more women’s matches should be on the WWE Network’s 100 Best Matches…List!